PLEASE SEND US A MESSAGE AFTER PURCHASNG WITH YOUR PERSONALISATION DETAILS. Perfect 1st, 2nd 3rd, 5th, 6th, 25th, 50th, Golden, Silver, Diamond or Ruby Wedding Anniversary gift idea or even for your husband or wife to be or on an engagement occasion. The design features a great first dance songs lyrics and makes a great gift for any occasion. This is a perfect addition to your home decorations. The cushion can sit proudly on sofa in your living room or bedroom. 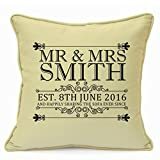 If you wish to have a cushion made to order with personalised message on the bottom, some other song lyrics, custom quote, message or a picture please send us a message and we will be able to design that for you. The cushion is 18 Inch (45cm) approx. It is made of cotton blend fabric featuring a sturdy zip and piping around the cushion. It is constructed with durable stitching which makes it a quality product. The cushion comes without the Infill. Our cushions are made in the UK. It’s Machine Washable. All orders are shipped within 1 working day. The cushion cover comes without the infill. Our cushion covers are made in the UK. It’s Machine Washable. All orders are shipped within 1 working day.